Dr. Celia Ziel was raised in South San Jose and earned her undergraduate education in biology at Santa Clara University. She completed her optometric education at Illinois College of Optometry in Chicago where she received her doctorate degree. Since graduating in 1992, Dr. Ziel has worked as an optometrist in several offices in the Bay Area, but enjoys practicing in her own practice, which she established in Pleasanton in 1996. Dr. Ziel has special interests in contact lenses(including CRT), eye disease, LASIK co-management and primary care optometry for all ages. Dr. Peter Miller was raised in the Los Gatos/Santa Cruz mountain area and did his undergraduate education at U.C. Berkeley where he studied biophysics. He continued his optometric education at the U.C. Berkeley School of Optometry where he received his doctorate degree in 1992. 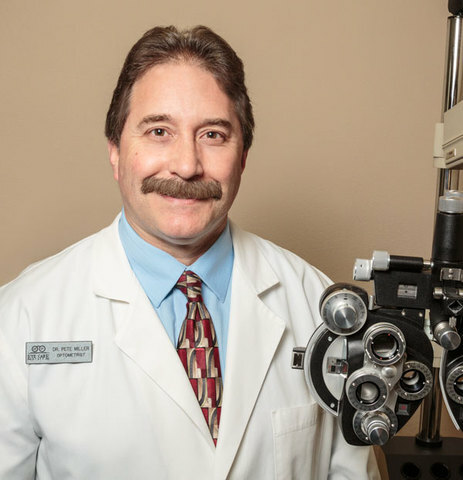 Dr. Miller has worked in several optometric offices from Santa Cruz to Milpitas, but finds private practice more enjoyable. Dr. Miller's professional interests include contact lenses (including CRT), vision therapy, developmental vision, ocular disease, LASIK co-management and primary care optometry. In early 1999, Dr's. Ziel and Miller, who are married , joined together and took over a retired doctor's practice in Pleasanton to form Pleasanton Optometry. Both doctor's share office and home responsibilities, which includes taking care of their 18 year old daughter and 14 year old son.